Home » What is a Geogrid and How is it Used? A geogrid is a geosynthetic made from a polymeric material. Geogrids are formed by weaving or knitting intersecting ribs with appropriate apertures (open spaces for the ribs to fit into). Primarily, a geogrid is used for reinforcement applications in various types of construction projects but can be used for separation applications as well. They are open grids which allow the soil to strike through the apertures and the two materials interlock together to give composite behavior. 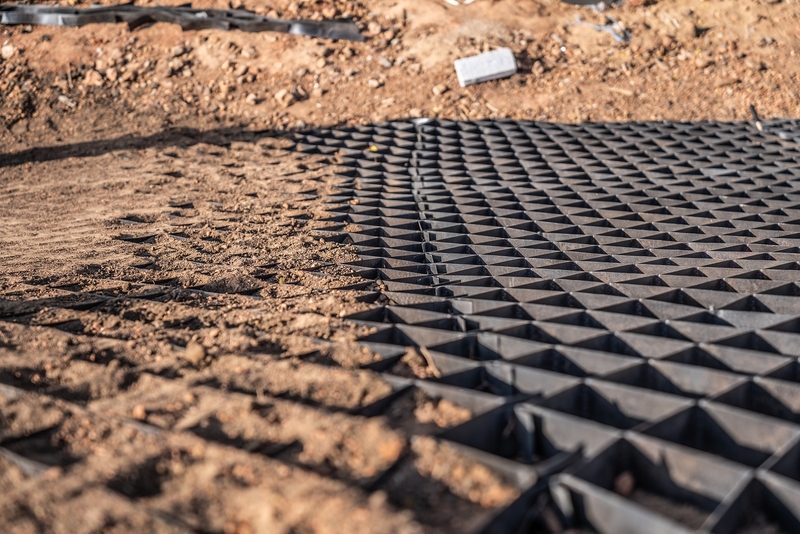 There is a high demand for geogrids in construction because they are good in tension and have an increased ability to distribute loads across a large area. There are a few different types of geogrids which each serve a specific function for the application they are being used for. Understanding the different strengths that each type of geogrid has is crucial for selecting the right one for your project. There are three different types of geogrids: Uniaxial, Biaxial, and Triaxial (Triax®). Each one is designed and manufactured for specific construction applications with various tensile strengths. Uniaxial geogrids are designed with the specific purpose of enduring stress in one single direction. They are formed by stretching the ribs in a longitude direction and their tensile strength is stretched in the machine direction. This means they are perfect for both wall and slope applications such as retaining walls, landfill liner systems, embankments over soft soils, and extra steep earthwork slopes. Biaxial geogrids are designed to have an equal balance of tensile strength in both machine and cross directions. This gives the geogrid the ability to distribute loads over a wider area than usual which increases its capacity in base stabilization applications. Biaxial geogrids are commonly used in applications such as foundations for roadbeds, railroad truck beds, permanent unpaved roads, airport runways, construction haul roads, working platforms on weak subgrades, and parking lots. 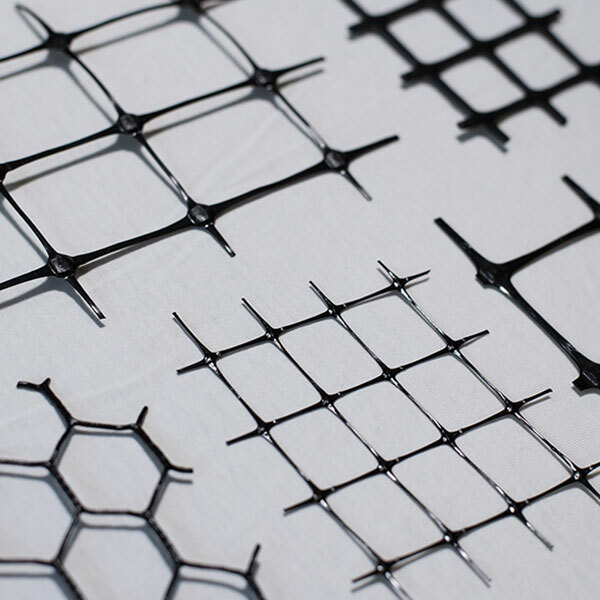 To provide an enhanced level of in-plane stiffness, Triax® geogrids are made from a punched polypropylene sheet oriented in multiple, equilateral directions to form triangular apertures. This creates a more efficient product that delivers optimal in-service stress transfer from the aggregate to the geogrid. There are several benefits to using geogrids in all types of construction applications. They can reduce the total cost of a project since apertures work with a wide variety of fill which allows contractors to use less expensive soils. Geogrids can increase the speed of construction which can lead to a reduction in overall cost as well. They reduce the depth of excavation required on unsuitable subgrades. Geogrids also provide enhanced safety and greater seismic durability by stabilizing slopes and increasing soil strength. By reducing the differential settlement of roadways, geogrids reduce the need for maintenance and extend the life of paved roads. Geogrids are highly resistant to soil microorganisms, chemicals, UV radiation, and mechanical damage. 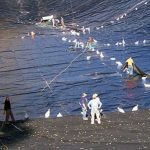 Depending upon manufacturing techniques and materials, geogrids can even be designed to resist creep when subjected to high loads for long periods of time or resist high, short-term dynamic loads. Most importantly, the use of geogrids is environmentally friendly. Do you need help choosing a geogrid for your next project? IWT Cargo-Guard provides the highest quality geogrids for all different kinds of construction projects. Whether you’re building a retaining wall or stabilizing a roadway, geogrids are crucial for any type of reinforcement application. We can help you decide which kind of geogrid will be best for your upcoming project. Contact us today to discuss your project.